The Badia di Orvieto, four-star hotel. This renowned historical residence is an ideal place for a stay immersed in the scenario of the green Umbrian countryside, offering a unique sense of well-being. Orvieto, ancient land of the Etruscans, lies on the main communication routes Florence/Rome, and is a crossroads of culture and traditions from the Val d'Orcia to Tuscia and thermal spas and baths. A site favoured by international tourism, Orvieto, with its heritage of art and its fascinating cultural events, is one of Italy’s outstanding attractions. 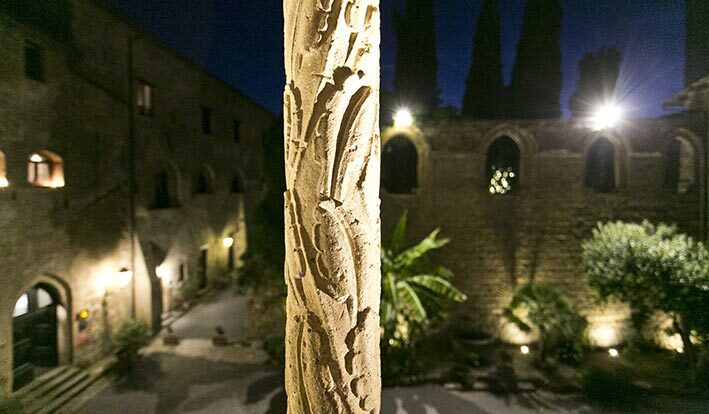 The 22 rooms and 5 suites of the hotel overlook the courtyards of the ancient abbey, the spacious park, and the hills clothed in olive trees and rows of grapevines with the tufa plateau and its majestic Cathedral rising up in the background. No better place can be found than the abbey for private events, celebrations and wedding receptions. It offers top quality service, with the restaurant, a swimming pool, tennis court and hotel bar. The Badia, whose origins make it qualify as the oldest hotel in Italy, offers hospitality to the guests of today, mindful of the saints and prelates who came here in the past for meditation and holidays. Careful restoration of the architectural features of the original Benedictine abbey of 1100 have made it a hotel that is a haven of peace and quiet, yet the centre of Orvieto with its medieval marvels is only ten minutes away. The rooms, furnished in classic style, including pieces of antique furniture, each have a personality of their own. Geographically the location of the Badia is strategic, and available activities range from excursions into nature, visits to archaeological sites and the neighbouring art cities, to participating in tastings and events in the renowned wineries and traditional olive mills. The Spas and Parks of the Waters of Upper Lazio and Tuscany are within easy reach. In two hours one is in Florence, and Rome as well as Siena are no more than an hour and a half away. It takes but an hour to reach Montalcino, Montepulciano and Pienza, and half an hour to get to Civita di Bagnoregio and the lake of Bolsena.